Why do I always overestimate what I can accomplish? Well, I guess it is better to aim high and fall a little short, than not to aim at all! I spent most of this week finishing quilts for our camper and then working with my husband to open up the camper, put up the summer room, etc. The good news is, that I packed up a sewing kit to leave in the camper since we will be spending half of our time here until the Fall. And as you can see, I finished two flowers. 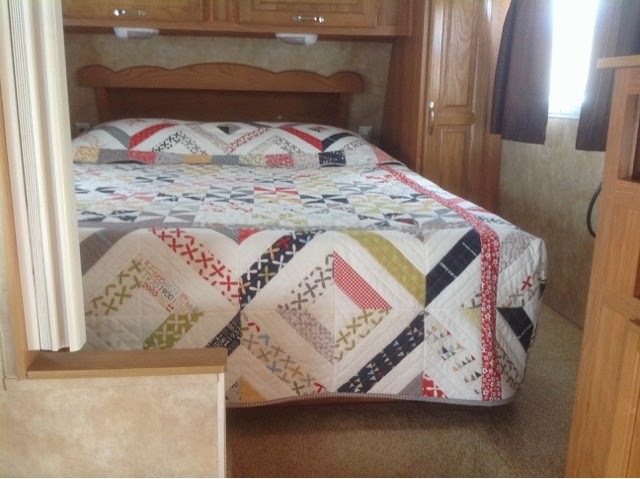 I finally got to see how the quilt I made for our bed in the camper would actually fit and I love it! Nice to see that my measurements were actually very accurate. While I was making it, I was crossing my fingers that I did not miscalculate anything as there was no way for me to test it out until Spring! So here is to more progress next week! Thanks to Jessica at Life Under Quilts for allowing me to participate in the Monday Morning Star Count! You are a wonderful group of people and I love watching your progress and wonderful projects! Love the flowers! And the bed quilt is fantastic! Ooh love the quilt for the camper. Lovely! And hurray for EPP progress! You must be very pleased with you the quilt turned out - it's lovely! It sounds like you been so busy--it is hard to believe you even did two flowers!! Good work!! I loved that quilt when you posted it before and now seeing it in its intended home is just making it seem even lovelier!! Is that even possible?! Fabulous!! Thank you all for your wonderful comments! 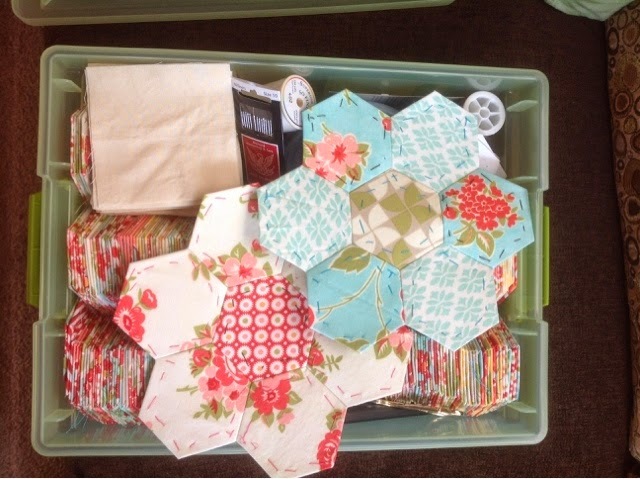 I am very pleased with the way the quilt came out....ummm...especially because I was making it up as I went! Nice when those 'design as you go' projects come out so nice! I really appreciate everyone taking the time to view my projects!